Which adwords ads below do ‘you think are better? Every advertiser needs clicks that convert to customers on their advertisements. The higher quality the click, the greater the chance your visitor will become a lead and a customer! One method to do that is to attach adwords extensions on your campaigns. This will enhance your PPC conversions by raising your relevant clicks. See how advertising with extensions supply additional information and simply add more real estate to your ad. Extensions in AdWords provide additional ways for searchers to connect to your advertising and to find out more about your company. Searchers go straight to the support page that they’re seeking directly from your advertising or are able to make a phone call right on your ad. Using adwords extensions allows more real estate PPC space to be taken up by your advertising property. This gets your advertising more noticeable than others who do not use it. 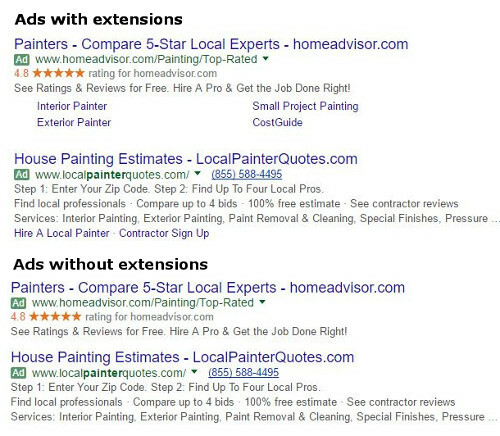 Simply compare the advertising with and without (above) and you see the advertisements with adwords extensions seem more insightful and more powerful than those without extensions. In case a searcher needs to see a particular page or unique advice (including critiques), adwords extensions can supply exactly that! Because you happen to be giving more details about your company and solutions to a searcher, they’ll have an improved idea of what to anticipate when clicking in your adwords advertising. Thus eliminating wasted clicks, that cost you money. In case a searcher clicks to your service page or calls your company from your advertising, you’re billed the same amount like they clicked on your headline. These clicks in many cases are more precious because the searcher is coming directly to your page/contact system they need to become a customer now. They do this because they are usually ready to buy from you. They save time and are less likely to get distracted somewhere else. Can’t discover everything you need to say in to two lines of Ad-Copy? Use call-out extensions to include as much as four messages in your advertising. Call-out extensions are excellent regardless of what your advertising copy says to cast a wide net so the exact same information appears on each advertisement. When a searcher sees your advertising (particularly on a mobile device), you need to provide them with the phone button you want them to call. Mobile users are less likely to search through your site and more likely to just call. When they find what they want via a call, they buy. Time is important to most of them. Include your phone# in your advertising so searchers don’t need to go to your web site to find your phone#. Call extensions simply click to call via mobile and you’ve got a conversation and great chance at a sale! Sitelinks enable advertisers to incorporate as much as four website links with their advertising. This looks more noticeable than other advertisements and takes up more ad real estate. It offers the chance to to discover the page that’s most useful for them as a searcher for your product or service. Occasionally these sitelink extensions will give a fast overview of the subpage which is especially valuable for including more. From phone #-to-descriptions-to contact pages and activities-benefits of your products/services. You are interested in being able to reveal the correct place to the correct searcher if you own a company with multiple places. Place extensions add your address, telephone number and business hours for each location. With 50% of cellular users visiting shops on the exact same day they do a search, having your location in your advertising is vital. It reveals to searchers how close your company is to them! If your company offers different kinds of services or goods, organized snippets are an ideal means to put these out. It’s possible for you to discuss different styles of goods, neighborhood communities where you operate, kinds of solutions, etc. in organized snippets. One of the extensions that are newer, lets you add offerings in your advertising. Not only is it possible to offer more details about your company, but you’re incentivizing a searcher to work with you. Instead of having to try to find special offers as well as trying to find the right company, everything can be found by them in one advertisement! Through the use of a 3rd party to review your web site, it is possible to get opinions, on customer support & your products showing up right in your advertising. Because recommendations and critiques are a big part of the decision process, having them in your advertising can help them choose your business faster. Do ‘You Want More Help From Outdoor WebResults…. 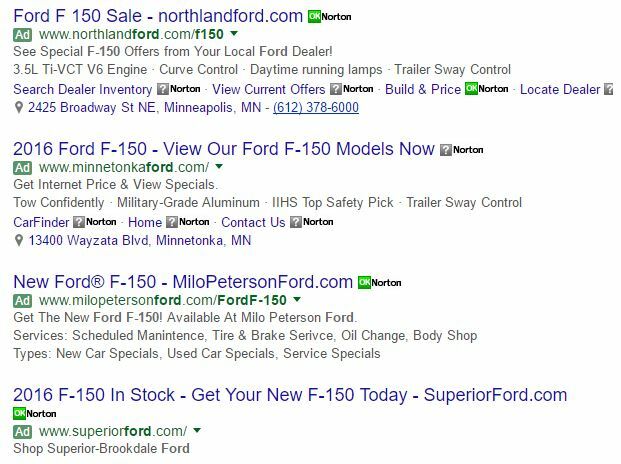 Whether you are looking to start a new campaign or enhance previously working adwords campaign, try including these adwords Extensions. If you want help, feel free to call us (507) 722-1504 or use the contact us form here.